I bought a new guitar, y’all. The last time I bought a guitar was in 2000, so I’m going to relish this moment for a while – bear with me. I was thinking about a new guitar for a long time because I needed an acoustic guitar that would be easy to travel with and still be useful in my church applications. I already had a Gibson J-200 with a basic piezo bridge pick up. This is a beautiful guitar and it sounds great, but it’s huge! I have a gig case for it and it feels like carrying a cello around. In college, I custom ordered a ATA flight case for it and that case is huge as well. The flight case also began to show wear even after only flying with it a few times. I also came to prefer carrying my instrument onto the plane for obvious reasons. So, I looked into selling my J-200. I looked up the serial number and “blue book” value. It’s not a cheap guitar. In fact, the process made me realize that I love this instrument and I don’t want to sell it. I want to pass it on to my children’s children. I started to look into dreadnaughts and the Taylor “concert” style guitars. These all looked like great instruments, but I was not convinced that they would be any better to fly with or would be that different from my current instrument to really justify the purchase. I was also looking at Godin guitars which I had always been interested in. I especially began to notice them after I saw Jaime Valle play one in a club in San Diego. 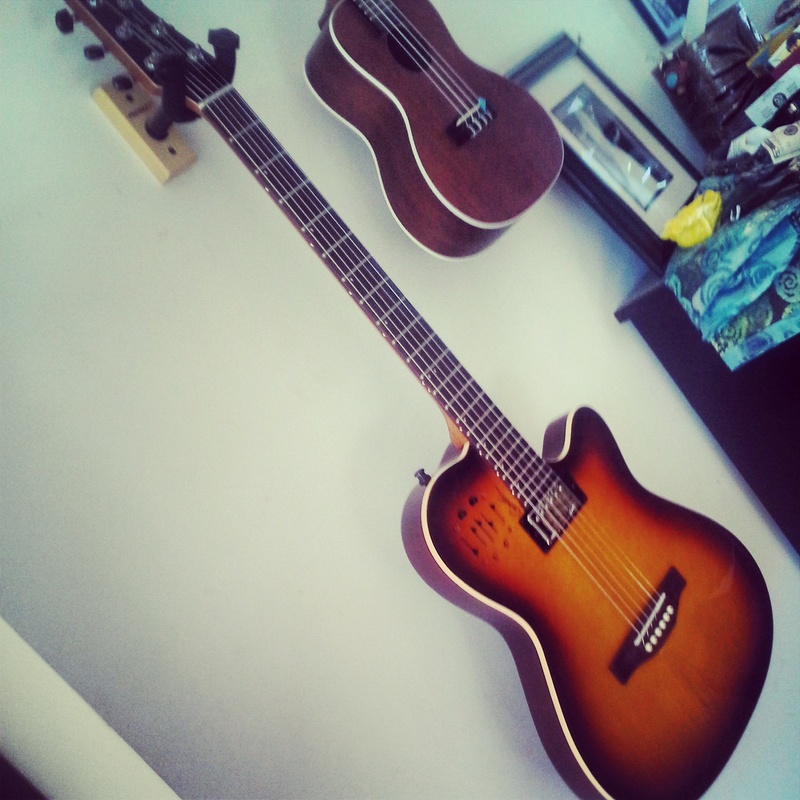 Godin’s have a thin body shape like an electric guitar. They are instruments designed for stage performance and not recording or “unplugged” performance. Then I came across the Gidin A6 Ultra. It’s basically an acoustic guitar with that thin chambered body of the Godin. But they added a humbucker pickup so that it’s basically capable of both electric or acoustic sounds. It’s not the first guitar to ever do this, but it’s pretty affordable and it also looks great. Honestly, I’m not a fan of sci-fi look of the Parker Fly guitar. It’s also more like an acoustic guitar that can do electric, so in that sense, it sounds like an arch-top electric. I was able to really try it out this weekend and there are a few things I need to work out. One is that the piezo lacks gain. Even though there is a battery powered preamp in the guitar, my sound guy was saying that he had to crank the gain up on the acoustic sound. We might try an active DI next time and see how that helps. I’m also temped to get one of these, except it means another $200. The pastor at our South City worship site, Kevin Vanden Brink led Staff Prayer this morning and he talked about the meaning of the creation narrative in our theology. We talked afterward about the need for good creation songs. So I wrote one. I’m a guitar player in a piano player’s world. In the context of Black gospel music, the guitar is not considered a lead instrument. Most choirs rely on keys, organ, or synths to lead the band and the guitar plays a support role by playing rhythm parts or maybe lead fills. To make matters worse, I’m a white dude and most white dudes show up to a cross-cultural worship setting with their beautiful Taylor or Martin acoustic and when the set-list strays from Houghton-esque “rockspel” then then they find that their guitar becomes less relevant. Then things get really ugly when the set-list includes a more traditional black gospel song. The guitar becomes downright offensive as the acoustic strum-er starts to make the urban, Chicago-style Black gospel sound more and more like rural Nashville-style SOUTHERN gospel. There’s a BIG difference. A good place to start is the 16 bar gospel form. My church sings a number of songs that use variations of this form: “Glory Glory Hallelujah”, “Jesus is on the Mainline”, “I Said I Wasn’t Gonna Tell”, “Now Let Us Sing”, and even more moderate tempo “God is A Good God”. Our children’s choir is working on an old southern gospel tune called “Glory Glory Glory Somebody Touched Me” which is all over youtube being performed by everyone from bluegrass legends to tiny little southern baptist churches. I had to make a demo for the kids to sing along with and I made my best effort to give it a little more “blues” and a little less “bluegrass”. This represents how I would play a 16 bar gospel song especially in a setting where I was the only instrument. There’s a driving quarters bass sound that implies what a bass player would do and I’m hitting the muted strings on 2 & 4 to simulate a snare drum. The chromatic lead-in to the dominant at the end of each chorus is a cliche that helps define the style. The results also make a play-along demo for bass or drums to practice their gospel chops or for lead instruments to practice improvising. Starting the New Year in the office enjoying listening to one of my Christmas presents. “Black and Blu” by Gary Clark Jr.
Is It Time for Guitar Lessons? I’ve been teaching guitar for the past 10 years. I’ve seen a lot of different kinds of students: kids, teens, grown-ups, jazzers, metalheads, punks, folkies, hipsters, bubblegum popsters and then the occasional guy who has no interest in music but his mom is forcing him to do something productive. Is it time for you to get lessons? Maybe you’ve hit a stagnant place in your playing. Maybe you love music and want to experience the thrill of performance. Maybe you want to do something more productive than serf for cat pictures and Star Wars parodies. These are all valid reasons to get motivated, but let me share with you what I tell people when they ask me about if they should take lessons: don’t take lessons unless you can say that you have time, passion, goals, and money – in that order. Time is the most important resource for guitar practice. You can’t learn the guitar or improve your playing without investing time. When I was in school, I practiced about 2 hours a day for 6 days a week (that’s pretty light-weight as far as music students go.) It wasn’t until my 3rd semester that things began to click and I felt real improvement. I’m not saying that you have to do that; I’m just making it clear that time is the most important factor. You will not improve as a musician without copious time spent in the woodshed. If you have a 30 minute lesson, you should try to practice 30 minutes a day for 6 days a week. Decide when your 30 minutes will happen and lock that time in place when you will say no to other activities or commitments. If you can’t commit the time to practice, then the lesson becomes your practice time and your progress is slowed down significantly. Passion might be more important than time, because without passion, you won’t sacrifice your time. However, passion is not what makes you better; it’s only the fuel for your practicing. There’s nothing more depressing for me as a guitar teacher than trying to teach a kid to play an instrument who has no passion for music. They never practice and when they do, all that comes out is a cold, robotic performance. Don’t make your kid take lessons until they are begging you for the chance. Don’t buy your kid a guitar until you have found them trying to build one from their bedroom furniture out of a desperate need to shred. Before you make music, you need to listen to music and be a fan. Every great musician was a fan first. Goals are more important than money. If you can define what you want to accomplish with your playing, then you can find resources for free online. You might not even need a teacher because there is so much content available to a motivated and goal driven musician. The greatest asset for me of sitting under the teaching of an expert was the process of learning how to learn, how to practice, and how to set measurable goals. Today, I don’t need lessons because I have learned how to make my own goals and pursue them. Obviously, your 12 year old might not have clear goals (unless “impress girls” is an acceptable goal) but you might have goals that you can make together, and your teacher can help you define those goals as well. Money is not as important, but it will cost some. You will need an instrument (eventually). You will need supplies like a tuner, picks, a strap, a case, strings, and books. However, I always advise parents to borrow an instrument before buying and don’t buy a cheap guitar that will not be fun to play. Perhaps you can give the kid an incentive to practice – every practice time earns a fraction of the cost of an new instrument. If you start a student out with a sense that music skill is an asset as well as a pastime, maybe they will find ways to create income in the future. Are you still interested in taking guitar lessons? What a coincidence! I am in need of a few students for the fall. Location and Times: I teach from our church offices at 1142 Hodiamont 63112 and my lessons are 30 minutes every week. I am available to teach Tuesday-Friday after-school or earlier. Method: My specialization is jazz so I can teach blues, rock, gospel, or R&B styles, and if you are just starting out, I teach a basic method that can prepare the student for any direction they might want to go with their music. Cost: My fee is $20 a lesson, so you will need to have to budget $80-$100 a month. send me an email at kirkwardmusic@gmail.com if you are interested in getting more info. In the bleak midwinter…I’m back in the office without an once of motivation to get to work. I have a virtual stack of emails to sort through, read and respond. I have 2 months of Sundays to create assignments. I have a couple of Sundays to plan worship services for. I have a new choir season to plan and purchase resources for. We are hosting the Reconciliation and Justice Conference here in 4 weeks. I have a 3 foot high stack of Christmas music that needs to be sorted and filed. Basically I have lots to do and no motivation to do it. On the up side, I got a new guitar this morning. Someone donated it to Steve St Pierre and he passed it on to me. Apparently, it was found in the dumpster behind a Toys R Us. 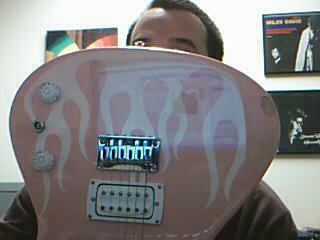 It doesn’t play at all, but check out the paint job – pink with flames! Thanks for the memories, Bedrock amp…hello Vibrolux! The summer after my freshman year in high school, my parents found a steal on a $900 50w, 1×12 combo amp made by the original “boutique” amp makers, Bedrock. The made a deal with me to give me the amp in exchange for painting the exterior of my dad’s studio, a garage-size building in the back yard. I was in a band at the time, “Celiac Spru” which was influenced mostly by the music of Nirvana, Smashing Pumpkins, and Rage Against the Machine. I found the small combo amp unsatisfactory at the time because it was a small, club amp in the context of a Marshall stack world. However, when my tastes changed as I went into college, I was interested in jazz and blues. I found that the Bedrock amp was actually a really nice compliment to my newly acquired Gibson Howard Roberts guitar. Fast forward 10 years, and I’m still playing the Bedrock in my professional music career. It served me well in many gigs, jams, and worship services. This past summer, it was not behaving well. I changed the tubes, but the sound was still lacking. This week, I decided to put the old Bedrock out to pasture. After about 16 years of making music, I think that it’s ok to move on. Yesterday, I was snowed in, hanging with the family. I’ve been borrowing Ben Church’s amp, a Peavey Delta Blues, for several months. Ben let me know that he’d like to sell that amp which brought me to terms with the reality that I had been avoiding: the Bedrock must be replaced. 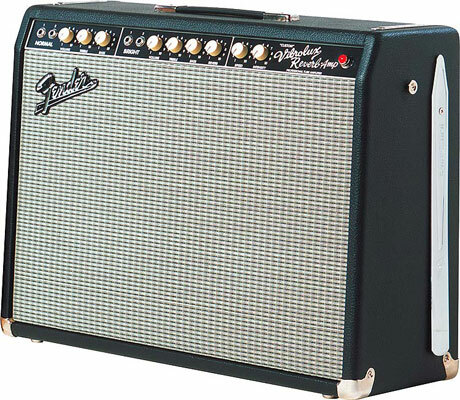 So, I was looking at Guitar Center’s website and found that my local store had a used Fender “Custom” Vibrolux-Reverb. This amp lists on Musician’s Friend at around $1200 and they were asking $620. I ran out there (very carefully on the ice) and snatched it up. The amp is a 40w 2×10 with 2 channels, 5 12AX7 tubes, 1 12AT7, and 2 6L6 tubes, spring reverb, tube vibrato, and Jensen speakers. I think you can tell that I’m a little giddy. Curtis, can you bring the funk this morning? Why is October going to be “the jam”? Our annual church retreat is a great time to relax, meet people, and jam for Jesus in the back woods. We usually have an opportunity to worship in a more informal and extended context at some point in the weekend. I look forward to that time to pull out all the songs that people love to sing with gusto. Let’s not forget the S’mores, too. October 16 – NCF Choir rehearsals begin! MCU (Metropolitan Congregations United) for St. Louis presents a night of live music, food and fun to highlight our recent victories and to thank business and civic partners for their continued support for justice in our City. Featuring music from Hudson and the Hoodoo Cats, and food and beverages from Schlafly Tap Room. Fabulous silent auction and raffle along with great door prizes. Tickets are $30 each or $50/pair. Contact Kim Smith for tickets (314) 322-2389. The NCF choir will be singing a few tunes for the RSL crowd. I’m glad that we can be part of supporting this event. I’m working on a choral arrangement of the Compassion Art Project’s, “You Have Shown Us”. October 31 – PCA Reformation Service at Chesterfield Presbyterian.